Both of these workouts were my second of the day, I never have problems with workouts in the morning. I simply wake up, carb load and reduce my basal and I'm good to go. My initial thoughts are that my afternoon basal rate is too high on a day's that includes a second night workout. Tomorrow I have a second run scheduled at night so I'll reduce my basal starting at around 2PM or 3PM until the workout which will be at 6PM or 7PM. This will make less insulin active in my system for when the workout starts. My feelings are this is where most of the problem stems from. The insulin that is still in my body from my mid-day snack and the basal rate instantly gets kicked into gear once my night workout begins, bringing my BG down quickly, faster than the morning workouts. As my running and eventually my triathlon training has really stepped up over the last year, I've needed far less insulin. During college I understood the importance of reduced basal and carb loading before a workout but not like I do now. Studying these effects like my night workout basal rate and the meter I use is what really brings my diabetes into focus. 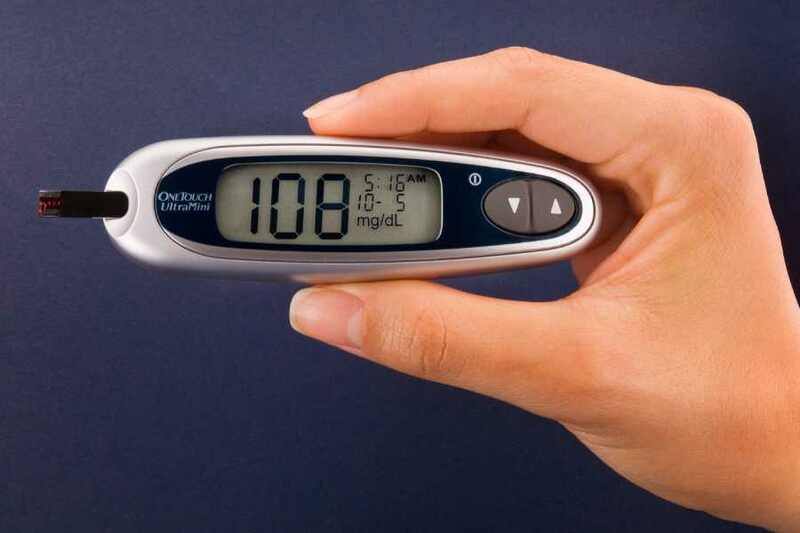 I really do suggest that any diabetic question everything, "why this meter and not that one", "is there a better pump out there for me", "what new insulin's have been developed lately". In my opinion, this is one of the biggest problems diabetics face, comfort. Much like the couch potato doesn't want to go for a run, a diabetic on injections doesn't want to change to the pump. While running my favorite meter is the TRUE2go, it's typically sold as an off brand meter. As you can see by this picture, it's perfect because it's small. Because of it's size and having the meter/ test strips in the same piece, I find that it's great to run with (so far my record is maintaining a 7:30/mile clip while testing the BG). However, typically in my "everyday" life I use the OneTouch UltraMini (I also use the OneTouch on my bike as it fits perfectly on the aero bars) but have found that sometimes I really like using the TRUE2go during the day as well. I can throw it in my pocket with a lancet and go (o the irony with it's name). Most people with the 'betes know that the OneTouch UltraMini is accurate. I think every diabetic magazine has given more praise to this meter than an Elvis fan praising the King at Graceland. Recently however, my endo made comments about the TRUE2go. "You only use that thing to get a semi-accurate picture while running right?". No, I stated, I like my little meter and use it a lot actually. Heck, the FDA approved the device. I decided to investigate. Below you can see my little study. After twenty three (23) readings with the same blood sample. So on average the TRUE2go and UltraMini were within twelve (12) points of each other. Well within the FDA's 20% range. The median is even closer. I did find that the readings tended to be different on rapidly raising or falling blood readings, accounting for a difference in the average and the median. (This could have been from the sample itself since blood that comes from the finger first isn't always as accurate as the blood that comes out after.) This justifies in my mind my use of the TRUE2go but also tells me the device could be off a little, which means I will keep using it the same way I do now, TRUE2go for runs, UltraMini for daily living. The previous day's ride took a lot out of me, I woke up a little sore and tired, I didn't really expect much from the race but this is good for the training. Running with heavy legs and a tired mind will only help me during the run portion of a hard triathlon or longer race (or even life). I woke up with a blood glucose of only 67. I felt a little low but it wasn't that bad. I went straight to the kitchen for my prerace sandwich, PB on wheat. No insulin and 30 grams of carb had my blood glucose up to 140 less than an hour later. Let's face it, race or not the 'betes isn't going to keep me down. Drive up the PCH (Pacific Coast Highway) to Zuma Beach (20 miles north in Malibu), register and go back to sit in the truck. God I love being up early. No new emails, nothing important on the radio, just the peace of the morning. Checked the BG: 140. It went a little higher over the next 15 minutes but nothing big, I bolused 0.5 units to stop the rise. Let's face it, I love the calm of the morning but I can't sit still, so I get out and start wondering. Looking to see if anyone else from InsulinDependence/Triabetes showed up yet. Didn't find anyone. More runners start showing up and the sun is now almost completely over the Malibu Mountains. Check the BG again, 220, so much for stopping the rise. I start eating a Powerbar, I eat about half and bolus. Warm up run time. 1.5 miles later I feel awake, I was worried about the soreness until that point, now I was completely awake. At this point I found Peter Nerothin (founder and president of InsulinDependence), he drove up from San Diego for the event. I always love conversations with Peter, there is constantly something to learn about diabetes from him, not to mention finding out how InsulinDepedence is progressing. They call us over to the start line, 240. Fine, it's only before a 5k, this will only last 23 minutes tops. I grab a gel (25 grams) and start to down it on the way over. GOAL: On the watch, under 23:00 minutes. Real mental goal, new PR. Come on! I just started this 5k running stuff, I've only been doing "true" speed work for two months, I can PR. My mind is in the way though, I'm sore, tired and not mentally prepared. I can hear Hartman (strength and conditioning coach in college) right now "get your head right". As you can see on the map, it's a two turn around course. Flat, fast and on a "not so wide" bike path. I saw the southern half on my warm up run but didn't know much the northern half. Once the race started it seemed to go further north than I thought it would. Shots fired! Race is off! My legs are so heavy at this point.... All I could think was "just get through the last mile". I followed a guy in front of me, I mean he pulled me the last mile and a half. I knew if I stayed on him I could keep his pace to the finish, if I let him get too far out, I would fall apart. Crumble. "Quitting lasts forever". Not happening. Finish: my watch says 20:53. Official results: 20:53. Final blood glucose: 323... Dang! The Powerbar had obviously fully digested and the gel as well. The adrenaline of race probably kicked it up a lot too. Even though I wasn't fully "up" for this race, just before the start I feel all the adrenaline hitting my body, at first it gives the feeling of a low blood glucose (at least for my 'betes) then as the gun goes off I know it's just the adrenaline. Either way, the race is over, I bolus and it goes down. Overall, the race was good, it hurt during the race but my time keeps getting faster. 20:53 is nearly a complete minute faster than my previous PR, it keeps me excited to keep racing and more fit. Special thanks to Peter Nerothin for coming up to San Diego and getting up at 4:00AM for the dawn phenom. Had my first triathlon this last weekend. Rising at 4:45 my first blood glucose (BG) reading of the morning was 176, the night before I had a big pasta meal which ended up in a low right before bed (81 but obviously going down according to the CGM). The 32 gram Gatorade ended up bringing it up right away which allowed me to go to sleep. I had a peanut butter sandwich (45 gram), gave a normal bolus (however, I did not take symlin which I normally do for three meals a day, this is something I need to practice more during training rides before trying it on race day). I had a powerbar (45 grams) at that point, didn't have any insulin. I wanted to wait to see where it would go. I had to go set my pump in transition so I knew after this I wouldn't have any balas. The race website said waves would go off every three minutes, I was wave nine. That means at 7:27 I would start my swim. So I put my pump in transition at 6:30, about one hour without insulin before the swim starts. Well that was the plan anyway. When they started announcing instructions they told us it would now be every six minutes... UGH! Took my BG at 6:50, already up to near 280. Luckily, my girlfriend Jamie had my symlin pack which had a needle with a vial of insulin in. Gave myself one unit. Took my BG about 25 minutes later at 7:15, it was up to 340, okay then, more insulin. I gave myself about 1.5 units. At 7:35, it was 330. I was fine with that, the rise had stopped. Swim started at near 8..... well I didn't die at least but that is going to take a lot of work. Got out, one thing I learned is to take my BG right before getting on the bike (good luck with that, I'm too competitive to slow down like that on a short race). I took my BG about four miles into the bike, 280, I had a gel (22 grams), gave myself 2 units, knowing I would have another one soon. In the last mile of the bike I had another gel along with more water. At T2 switched into my running shoes and was off. The run went well, had a 23:06 split in the 5k. Happy with that, feel closer to my current goal of a 20 minute stand along 5k (current PR 21:45). Special thanks to Jamie for getting out of bed early and going with me (and taking all those pictures). I’ve always been an athlete. But I’ve also always had the ‘betes. Well not always but since I was twelve. Might as well be forever, I don’t really ever remember eating without thinking “how many carbs are in that”. I got really sick when I was 12, lost a ton of weight. I still remember my dad, Paul Mirr (friend growing up that I always played baseball with) and I standing in the garage and Paul saying “Brennan has lost a lot of weight”. I had but maybe it was a growth spurt right? We loaded up the truck and went up north to the baseball tournament. About four days later we all knew I had the ‘betes. Fast forward to college. I still played baseball but didn’t pay close enough attention to the ‘betes yet. Granted, I took care of it and worked out all the time but there was still always something missing, I knew the control could be tighter. Fast forward again, just before graduating from college I decide, “I still need something to do with sports”. So I did two things: (1) I bought a tri-bike (babe the Blue Ox as I like to call her) and (2) I went to graduate school for Sport Management in California. Seems like a good idea right? Out in beautiful California with a bike and soon to be master’s degree. So I’m 23, two days away from doing my first triathlon and a year away from having a master’s degree. The control of the ‘betes is 100 times better. I don’t party anymore (like in college), I joined a great group called InsulinDependence and met a ton of great people in the diabetes community. My goals include someday completing an Ironman and longer distance races to help support Triabetes (the subgroup of InsulinDependence) and help mentor a child with the 'betes. Thanks to people like Peter Nerothin (founder of InsulinDependence), Nate Heintzman and others I’ve met through InsulinDependence (click on the link on the left to find out more about them) I have the network of people I need to help me with my control of my ‘betes. From Ashely Hall who always answers my random CGM questions to Christian Chiappe who I will go to Vegas with for a triathlon in October, this is the support team I need to help maintain and support my healthy lifestyle and control the ‘betes. I’d also like to thank my parents, who without their support I’d never be able to workout and do triathlons/ running events while in graduate school. Thanks Mom and Dad for all your love and support. And of course thanks to Jamie for putting up with the long runs and rides and always going with me.